Tension engagement ring are so called because of their design where the precious stone is set and secured in the ring using extreme pressure from the ring setting. The effect is marvelous as the gemstone looks like as though it is magically suspended from each of the sides in the band. Tension engagement ring have a truly unique style and magical look which is inimitable by other jewelry. Jewelry experts opine that tension mounting is the most effective way to highlight a stone’s intrinsic worth. It can brighten the stone color and also makes the precious stone more secure than a traditional setting. A tension setting can vary from 65 to 95 pounds stress on the center stone and set in 14K and 18K yellow/ white gold – apart from platinum. When tension engagement ring first came into the market, many couples were apprehensive of the safety of the gemstones as the stone was apparently held into position through mere two points of contact. But time has shown that when the setting is made properly, the stone is, in fact, held much more securely in a tension ring compared with a traditional design setting. Novori is one of the few jewelers who can make high quality, secure tension set rings. 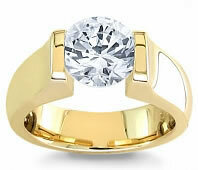 Originally, tension engagement ring were considered fit only for men as they looked simple and unostentatious. But once the market for tension engagement rings picked up, a plethora of design and style options started flooding the market and today, it has become the preferred choice of many prospective brides. In view of the many different elegant styles, more and more women are opting for tension rings not only as engagement rings but also as for wedding and birthdays. Interestingly, the metal increasingly used for tension rings is gold in view of its natural strength and durability. The strength of tension engagement ring settings can be attributed to the strength of the metal as it is the metal that helps a tighter, stronger fit. Once thing to be aware of is that tension rings cannot be easily resized as a normal setting can. A tension ring should be made to the correct size required and the finger measurement should be made by a professional jeweler. This is usually a charge to resize a tension ring because of the labor involved. 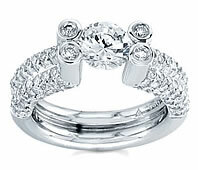 Call Novori Jewelry for details on having a tension ring resized. 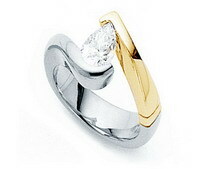 Tension engagement rings are also available in platinum, white gold, yellow gold and in some cases even stainless steel. As only tough gemstones can withstand the pressure of tension setting, diamond solitaires, rubies, cut emeralds and sapphires are widely used. For this same reason one rarely comes across cubic zirconia and moissanite being used for tension ring. They are too fragile and may fracture during manufacturing of the ring. Novori Jewelry will not set a tension ring with a man made stone as the risk of fracture is too great. If you have ever seen a tension ring you will know that the tension setting of a precious gemstone in the ring lends the jewelry a classic look unmatched by any other. As there is a variety of styles and designs, couples can choose a tension ring – preferably an antique tension engagement ring that will really stand out and grab attention. Couples should remember that an antique tension engagement ring is very strong but at the same time a delicate piece of jewelry that needs to be handled with care. There is no other way to fully highlight the beauty and brilliance of a stone than having it tension mounted and enhancing the color by as much as two grades. If you make the right choice of an antique tension engagement ring, you will never ever have the heart to part with it and will wear it lifelong. It is said that if you want to really convince your bride how much you truly love her, then an antique tension engagement ring is the right choice. At Novori Jewelry we are ready to help with your tension ring selection. Just call us toll free at 1-877-877-4141 for assistance with the selection of a tension ring or loose diamond.